Longtime playwright/performer and San Francisco native Charlie Varon jumps onto the stage. One second he’s Varon, the next he’s Bernie–an instantaneous transformation from charming 55-year-old storyteller to cranky 83-year-old nursing home escapee. 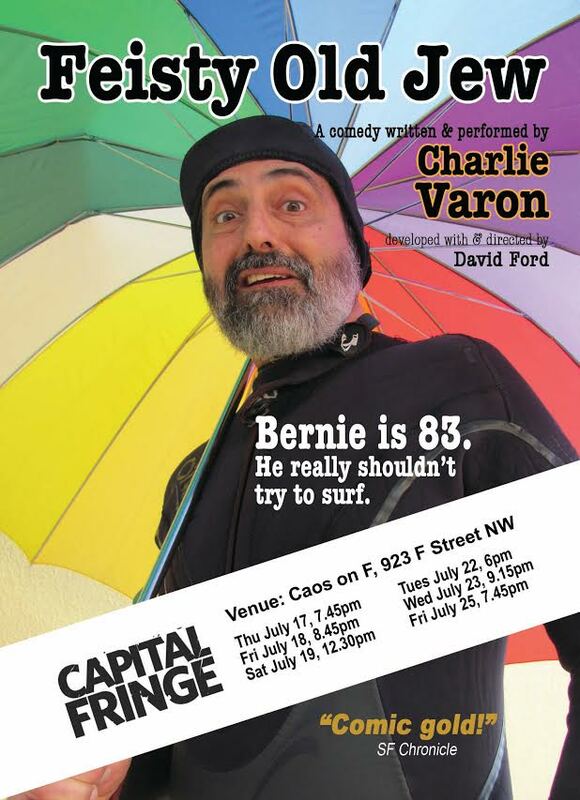 Last week, Washington, DC got a mouthful of Bernie’s mind in Feisty Old Jew’s opening performance in the annual Capital Fringe Festival, a celebration of experimental theater. Raised in Depression-era Brooklyn, Bernie watches, but mostly hates, everything young and new happening to San Francisco. The story takes off on a particularly hot day where Bernie hitches a ride with some 20-year-old surfers in a Tesla, and bets them $400,000 that he’ll be able to ride a wave. Besides the enjoyable storyline and smooth character transitions, it is Varon’s ability to embody a grumbling old man bewildered by hipster lifestyle and the popularity of Starbucks that distinguishes Feisty Old Jew. Despite all Bernie’s complaining, he is delightful to watch. His quick temper and cynicism aren’t tools for entertainment but expressions of his identity. Varon succeeds in re-imagining one of comedy’s most traded-upon tropes by refusing to play on stereotypes, creating a genuine and persuasive interpretation. Bernie’s story is the first in a series based in the San Francisco Jewish retirement home. Even those less amused by the performance have to give Varon credit. While sketch and improve dominate the comedy scene, storytelling seems to have fallen off people’s map. It takes a whole different skillset to entertain a live audience with slow simmering humor than with strings of jokes. Varon achieves an incredible feat, captivating an audience through single-handedly embodying four unique characters, and never missing a beat. You can catch Feisty Old Jew on July 22, 23 and 25.